Team 4488 is a rookie team set in the heart of Oregon's engineering community. With so many engineering businesses here, we see the need to promote both management and public relations efforts as well as competitive technology applications. The Team was founded by Chris Steiner and the Tenca Family. 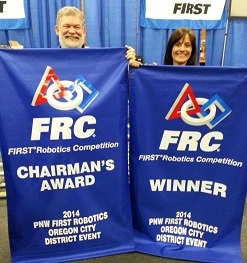 Steiner contacted Glencoe to start the team after his daughter, Mary, graduated from another FRC team in 2012. After looking at the impact FIRST had on his daughter's life, Chris decided to give the same opportunity to more students in Hillsboro. The Tenca family, founder of Team 1510, had been involved in FIRST for 12 years at that time. Williane and Alexandre Tenca volunteered since their first son, Jean, was a freshman in one of the first FRC teams in Oregon, Team 955. Their younger son, Caio, became part of FIRST while in middle school. Jean graduated from the University of Washington as an Electrical Engineer and is a Senior Software/Hardware R&D Design Engineer at Synopsys. Caio graduated with a CSS degree from the University of Washington and is a Software research and development Engineer at Google. Team 4488 has been doing well since its rookie year. Our countless hours spent improving the team and community from our mentors and members have brought us far. Some of our mentors are FRC alumni, who share their valuable experience, with gracious professionalism. Local companies have been contacting the team and showing their loving support. The Glencoe staff has also been very helpful, especially Mr. Mike O'Connor, the shop teacher.